A stratovolcano near the north end of Adak Island, which is part of the Aleutian Islands Chain. The village of Adak is just southeast of this volcano. There are no recorded eruptions. From the village of Adak, simply hike northwest to reach the summit. 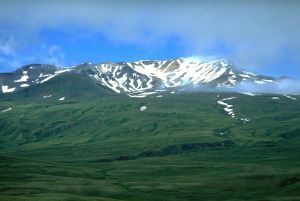 This mountain has been skied more times than any other volcano in the Aleutian Islands due to its ease of access, which included a now defunct tow-rope on its lower slopes. Until 2000 Adak was home to a large military base with well over 6000 people, however the Navy closed the base and now the population is around 300 and is in the control of the local native Aleut Corporation. The base did leave extensive infrastructure including an airport which serves the air services to and from Adak.